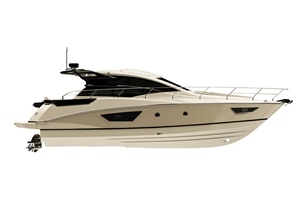 With her elegant sporty line, the Gran Turismo 46 retains a completely open hardtop, electrically operated side glazing and a wide glass door that protects the cockpit. 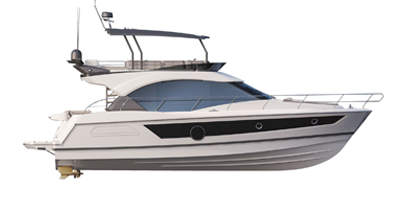 A perfect combination between protection and clear space, she offers an aft galley.For the first time, the latest planning hull generation offers a choice between a Volvo IPS 600 or a Z Drive engine, allowing up to 2 x 400 HP. Both safe and easily maneuvered, this model promises satisfaction at the wheel. Both protective and open, the ultra-spacious cockpit is equipped with electric glazed windows and an optional fully opening glass door. Air Step® 2 marks considerable development and is now compatible with Volvo IPS engines. By increasing the volume of air inflow under the hull threefold and reducing fuel consumption, she accelerates faster and gains speed. The latest generation of this patent has proven its worth, offering excellent seakeeping, minimal resistance through waves, linear acceleration and tight turns. The “air cushion” effect aft of the hull procures amazing comfort. Designed for loads of up to 770 lbs, the large swim platform is submersible and can easily take the weight of a Jet Ski or dinghy. There is a storage locker in which all your swimming and water sport accessories can be kept close at hand. Full beam owner's cabin and guest cabin with V-berths, sea view on both sides and ensuite bathroom. Fitted galley, 61 US gal refrigerator/freezer and plenty of storage. Optional, oven/grill and vitroceramic hob. Interior U-shaped lounge seating 6 people. Panoramic porthole for a sea view on both sides.